Founded in 1987, the Mahn- & Gedenkstätte commemorates the victims of the Nazi regime and is a museum, archive and a research centre. 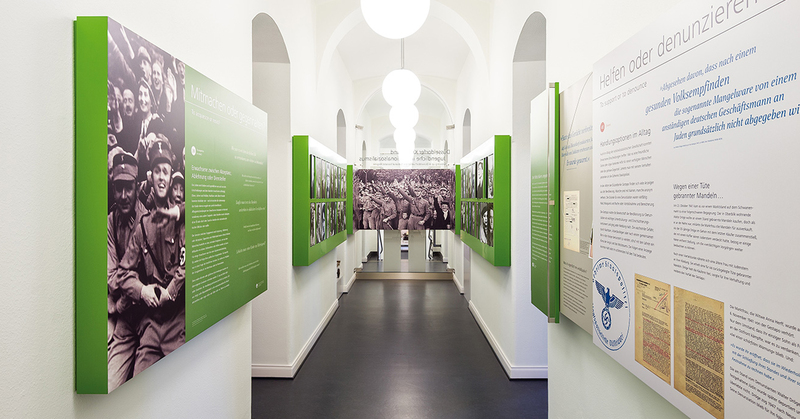 Following its renovation and reopening in 2017, the centre has won awards for the excellence of its exhibitions. Its notable benefactors include the comedian and author Christian Ehring, the rock singer Campino as well as Thomas Geisel, the Oberbürgermeister and our honorary vice-president. We shall meet in the foyer of the Mahn- & Gedenkstätte at 13:50, the tour beginning promptly at 14:00. The guided tour of the centre in English will last about an hour, to be followed by ca. 30 minutes of personal time in the exhibitions. At 15:30 we will begin a tour with the same guide of the Düsseldorf Altstadt during which we will examine traces of the Third Reich, including the Stolpersteine (the brass plaques set into our pavements commemorating victims of the Nazi regime). The outdoor tour will end at about 17:00, after which we will retire to a local Altstadt brewery for refreshments, which will be paid for individually.